Acknowledgments. List of contributors. Introduction (J. Heckhausen). Attachment, Curiosity and Anxiety as Motivational Influences in Child Development. Curiosity and anxiety as motivational determinants of cognitive development (C. Trudewind). Attachment and behavioral inhibition: two perspectives on early motivational development (A. Schölmerich). Activity and motivation: a plea for a human frame motivation (R. Oerter). Motivation, Emotion and Interests in School Learning. Motivation and self-regulated learning (F. Rheinberg et al.). Interest and human development during adolescence: an educational-psychological approach (A. Krapp). Goal orientations: their impact on academic learning and their development during adolescence (O. Köller). A social-cognitive, control-value theory of achievement emotions (R. Pekrun). Training in empirical research methods: analysis of problems and intervention from a motivational perspective (R. Stark, H. Mandl). Motives, Goals and Developmental Tasks as Organizers of Developmental Regulation. A theory of self-development: affective fixation and the STAR model of personality disorders and related styles (J. Kuhl). Developmental regulation across the life span: an action-phase model of engagement and disengagement with developmental goals (J. Heckhausen). The interplay of work and family in young and middle adulthood (B.S. Wiese, A.M. Freund). Are discrepancies between developmental status and aspired goals a sufficient motivation for developmental progression? (I. Seiffge-Krenke). Cohort change in adolescent developmental timetables after German unification: trends and possible reasons (R.K. Silbereisen, M. Wiesner). Work, Love and Children: Individual Motivation and Societal Conditions for Mastering Developmental Tasks in Adulthood. 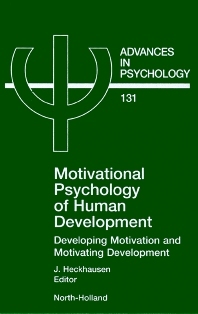 Motivation and volition in pursuing personal work goals (L. von Rosenstiel et al.). Self-starting behavior at work: toward a theory of personal initiative (D. Fay, M. Frese). Stability and change in romantic relationships (H.-W. Bierhoff, E. Rohmann). Motivation for parenthood and early family development: findings of a five-year longitudinal study (K.A. Schneewind). Name index. Subject index. The idea for this book grew out of the conference "Motivational Psychology of Ontogenesis" held at the Max Planck Institute for Human Development in Berlin, Germany, in May 1998. This conference focused on the interface of development and motivation and therefore brought together scholars from three major areas in psychology - developmental, motivational and lifespan. This combination of fields represents the potential influence of development on motivation and the potential role motivation plays in development and its major contexts of family, work and school. Thus, contributors were chosen to apply motivational models to diverse settings of human everyday life and in various age groups across the life span, ranging from early childhood to old age. For students and professionals in the areas of developmental psychology, motivational psychology and researchers in lifespan development.